Landowner relations’ has been an important issue in fox hunting for all time. Without the land and owners’ consent for use, there is no opportunity to hunt from horseback with hounds. Landowner relations remain a primary issue. The changing nature of our society has impacted hunting in a variety of ways. People in general, and members in particular, tend to be less connected to the land, and less familiar with horses, livestock and farming/ranching as compared to members in decades past. We also find the average farm and ranch acreage to be smaller often requiring relationships with a greater number of owners. Population growth, sprawling communities and loss of open space to commercial enterprises has forced many hunts to find new country. In the remaining open space, it is always easier to maintain existing country with positive landowner relations, than it is to open new country and develop brand new relationships. All of these factors suggest that attentive and informed leadership on the issue of landowner relations by or under the direction of a Master will be more successful in maintaining access to foxhunt. Many readers will be familiar with the statement, “The tail of the fish goes where the head of the fish goes.” In simple terms, it suggests that people will follow the example to which they are exposed by their leaders. If led with consistent, good examples of behavior in and out of the field, members generally will follow that example. For that reason, it is essential that the hunt leaders consistently demonstrate optimal behavior and respect for the land and its owner. Jef Murdock, MFH of Old Chatham Hunt in New York’s Hudson River Valley has framed his perception of the landowner relations role as “being a great neighbor.” He has reached out to landowners personally with activities such as knocking on doors and inviting them to post-hunt gatherings. He even includes non-participating landowners as a way of extending goodwill. Jef is realistic about the time it takes to develop good relationships and encourages others to understand that landowner relations require a consistent and long-term effort. There are times when a Master’s strengths lie elsewhere or s/he lacks sufficient time to devote to landowner relations; the best alternative is to delegate the responsibility to another who is well suited for the position. Such an individual should possess the following qualities: good communication skills, authentic, trustworthy, and humble. They must have sufficient time to devote to the task and it is helpful if they are well-organized. The Master must put the full weight of his position behind his designee and to be available to support them in any situation where the MFH’s presence lends a heightened sense of importance. Engaging members in landowner relations with the goal of developing a culture of good field behavior and respect is an effective strategy. Rather than simply relaying rules to the membership, a hunt that develops a culture of respect for the land and its owners will find members acting in everyone’s best interest. When a culture of respect for the landowner is developed, members are often self-policing and good behavior is promoted from within the membership itself. Hunts which develop such a culture, rather than a list of rules, will find themselves better positioned to maintain the hunt and its country for the long-term. Whenever possible, bring members to visit with landowners, so they too can come to know and care for them as a friend and supporter of the hunt. Many hunts bring home-made baked goods, hams and, on occasion, a bottle of Irish whiskey to landowners at holiday time to express their appreciation. If a large number of your hunt members are unfamiliar with farm life and things of importance to a farmer/rancher, invite the landowner to spend a few minutes talking about his/her operation with the members, allow them to share how they use the land for production and to support a family and employees. In this era, where people are less close to the land and many are unfamiliar with livestock, it is even more important to talk about closing gates, alerting the Master to downed fences, ailing livestock, a new born calf, or something amiss in the field. The MFH might consider designating a volunteer to develop a series of informational talks of approximately 5 minutes in length given by leaders, members and landowners to increase the members’ understanding of the land, a livestock operation and crop farming. A technology savvy volunteer might videotape these sessions and make them available on the hunt’s website for future use. Developing strong landowner relations is essential to maintain access to hunt country. Societal changes suggest we may need to invest more time and energy in the effort, especially when it comes to teaching youth and new hunt members’ proper field behavior and other ways to support good relations. Landowner relations takes time and consistent effort, however, the rewards include more secure and potential new country, the possibility of new member, and a solid foundation for the future of the hunt. 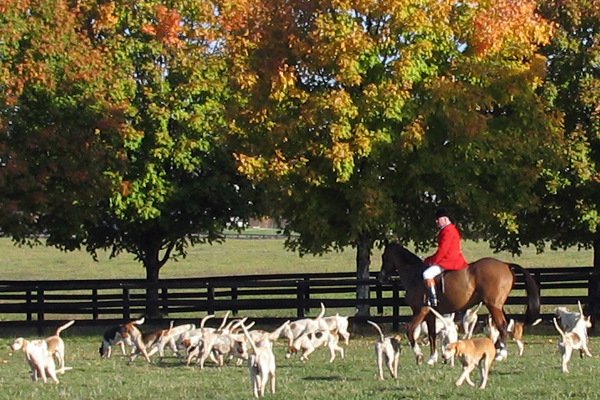 The Woodford Hounds has acreage in three KY counties on which they hunt. They have been very successful in opening new territory, permitting flexibility if one country is not ideal or available for hunting on a particular day. Woodford’s Crab Orchard territory alone has 80 land owners. Above all, be true to your word. Always make sure there is a complete understanding when putting in gates and jumps. After permission is granted, build exactly where the landowner stipulated and afterwards go with him/her to make sure everything is all right. If the landowner wants a bar over a jump, make sure it is in place especially after the hunt. It is important to honor the landowners in a way that makes them feel special. Our Landowners Picnic is a great BBQ including pot luck dishes prepared by members. Tables are dressed with tablecloths under shade trees, and we offer a Bluegrass band or other entertainment. Organized games and fireworks are great entertainment for families. Landowners are honored at our annual Hunt Ball. They are offered complementary tickets, acknowledged in the printed program, and recognized by the MC from the podium. Ideally, at least one Master should live in the hunt country, but if that is not possible then the Master(s) are wise to spend time in the country and calling on landowners when not hunting. If there is a problem (which is inevitable), address it RIGHT AWAY! Call on the landowner in person. NEVER let an issue go unattended. Arrive promptly at their place knowing that humility is the best policy. Above all, treat landowners as you would want to be treated. And, remember that they can tell if you are sincere.